I had a few hours before work today so I got out on the lake to spend a blue skied, windless morning chasing jumbo perch. 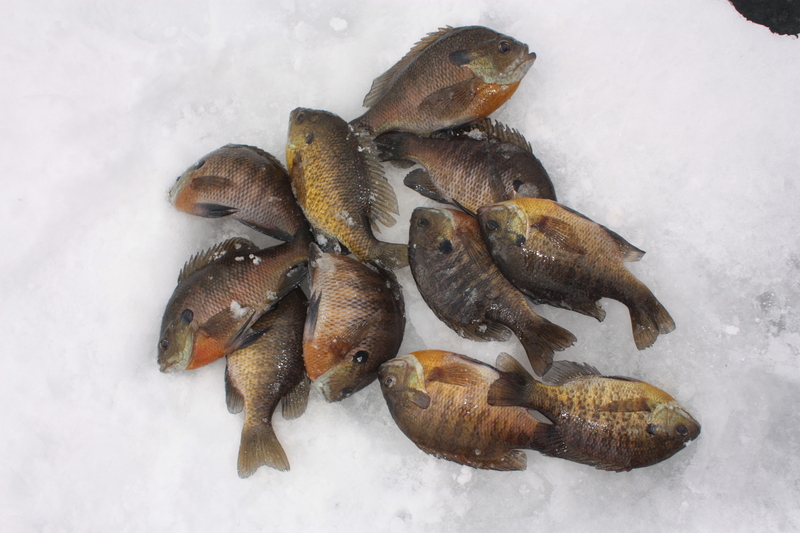 The perch bite has been slowing up and they are on the move big time now. Being alone, the chase was made a little more difficult but much more rewarding! I started the day around the area that I had luck the last few trips. It took a few holes to mark a fish on my Vexilar but as usual when I could find them, they bit. 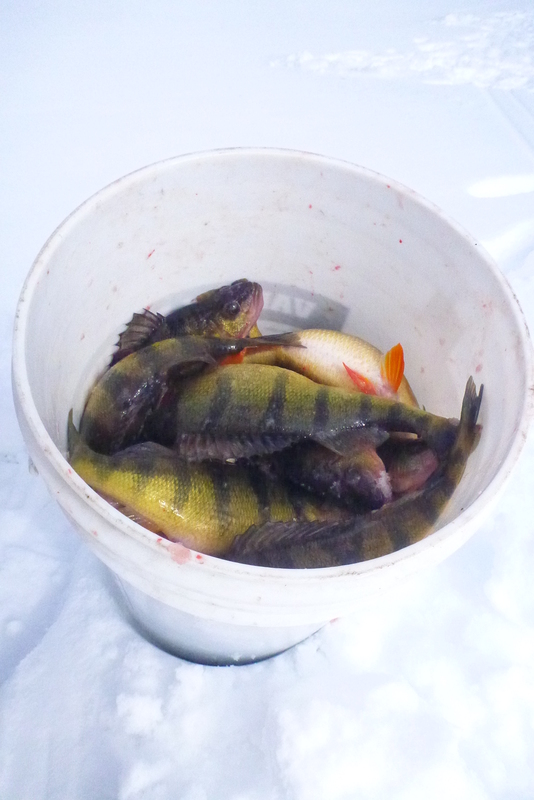 I ended up punching close to 150 holes over the next 4 hours and only was able to connect with 15 perch. Stumped on where the fish were, I worked my way towards shore from where the fish had been although I stayed at the same water depth. A few holes into the string, I hit what I was looking for. 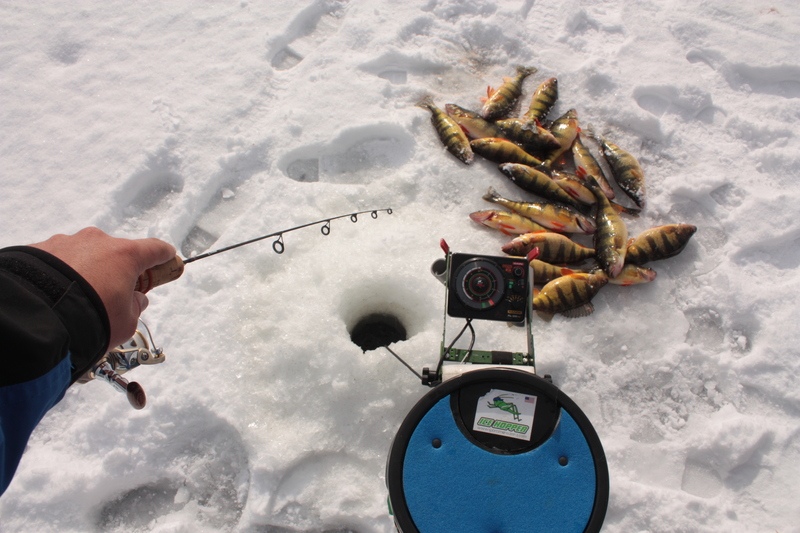 In about less than 15 minutes I pulled 19 big perch out of a single hole! My bucket was filling up fast! It was clear when the bite slowed at the spot because the fish were sparse and were a bit more tight lipped. Not wanting to lose the fish I punched holes around the area and began working through. Although I lost the active fish, I managed a few more and walked off with my head up and a 2/3 six gallon full bucket. I couldn’t resist as I walked off hitting a weedbed for a little bit looking for bluegill. The fish in the particular area have been running a bit small this year but a few fish are better than no fish! After punching holes, I started fishing feeling a crunch for time with a bucket of fish to clean before work in a little over 2 hours. The fish cooperated with me. I connected with many but kept 11 medium sized gills for the freezer. I threw back a bunch of small fish and a few 9-10″ bulls. Although the bite was slow it was a good way to top off a great morning of pulling the jumbo perch out of deep water!